Such a wee room but it's nicer than mine! At the time of finishing Cambria's room, she is 2.5 months old. Since we were in the midst of moving houses while she was born, I didn't have the luxury of setting up the nursery ahead of time like I did for Greyson...which also meant I didn't have time to make any customized mobiles or items for her room :( Subsequent children after the first always get the short end of the stick right? 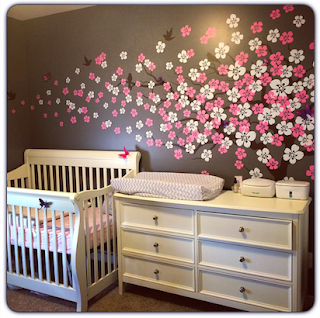 Keep on reading after the jump to see more details on the nursery as well as see a video of the entire room contents! Exciting no?? 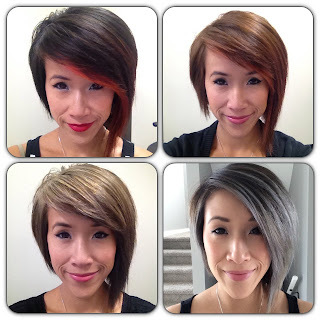 Click the jump to see my transition into blue hair! The color isn't as blue in this photo, fyi! I can sum this up in one word for all of you who don't have the time to read through endless posts on paint...AWESOME. Yup, I'd was skeptical and hesitant to purchase a gallon of this paint due to numerous negative reviews (and positive too), but I'm glad I splurged. The gallon cost me $60.97 cdn at Home Depot (and I'm getting a $7 rebate too!) and worth every penny, I think it's around $10 more a gallon than the other Behr paint and primer paint I've used in the past. Does this cover in one coat? I would say yes...but also want to add in that you will be using more paint each time you roll than you're used to. I read a lot of negative reviews saying that it streaks, that it took someone 3 gallons to cover one room, that this paint is only for professionals who know what they are doing...nay I say! Nay. I'm no professional by any means, but I have painted 3 rooms prior to this so I sorta know what I'm doing here. Anyways, keep on reading after the jump for my experience painting with a gallon of Behr's Marquee paint. For those of you parents who are worried about your baby developing a flat head aka Plagiocephaly, this is a great solution for preventative measures. It's essentially a little baby pillow designed to prevent your baby from having a flat head by easing the pressure on your baby's head with even weight distribution over a much larger area of contact. Simply put, it's like a nice cushion for your baby's head. Keep on reading to see my thoughts on this pillow!